VietNamNet Bridge - China’s policy on focusing on their domestic market has prompted foreign importers to place more orders with Vietnamese enterprises. The prosperity of the wood processing industry in the last year has been robust. Vietnam hopes it can obtain turnover of $8 billion from wooden furniture exports in 2018. Returning from AFIC (ASEAN Furniture Industries Council) conference held in Shanghai in August, Nguyen Quoc Khanh, chair of Hawa (Handicraft and Wood Industry Association), provided a noteworthy piece of news. Chinese policy makers said at the conference that 80 percent of the wood processing output would mostly serve its domestic market in the next few years. The demand in the world market means that other countries will have opportunities to receive orders from importers instead of China. 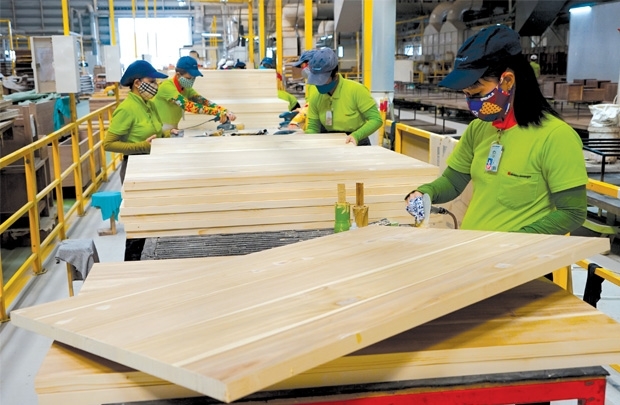 Vietnam, the second largest wooden furniture exporter in Asia and the biggest manufacturer in South East Asia, is most likely to receive the orders. According to Vifores, Vietnam exported $5.5 billion worth of wooden furniture in the first nine months of 2017, an increase of 10.6 percent compared with the same period last year, so the target of $7 billion export turnover this year is within reach. Nguyen Chanh Phuong, director of Danh Moc (Carpenter), said the transfer of orders to Vietnam began last year. Even Chinese manufacturers relocated their factories to Vietnam in anticipation of the TPP (Trans Pacific Partnership Agreement) and EVFTA (the EU-Vietnam free trade agreement). “This is a great opportunity for Vietnam for at least the next five years,” Phuong said. Besides orders from the major markets of the US and Europe, Vietnamese enterprises have also received orders from the Middle East and Australia, which were loyal clients of Chinese manufacturers. Phuong believes that China has every reason to focus on the domestic market. Its economy is thriving, income per capita has increased and the demand for wooden furniture is on the rise. The total demand in the world is $450 billion a year. China, with 1.4 billion people, is a vast market. However, Phuong believes China will continue exporting products because of the high profits. He said he can see a bright future for the Vietnam wood industry. Vietnam exports $7 billion out of total export turnover of $150 billion in the industry in the world, which means that the market is still big. South Korean, Danish and Swedish enterprises have chosen Vietnam to set up their factories, which will have positive impact on Vietnam’s brand.